Over the past few decades, a great emphasis has been put into developing and researching noninvasive techniques for monitoring respiratory functions in those with airway inflammatory diseases via biomarkers. The three most promising methods currently being researched are induced sputum analysis, exhaled nitric oxide measurement, and exhaled breath condensate analysis. Clinical applications of these three methods have the potential to transform the way we diagnose, monitor, and ultimately treat those with a variety of airway inflammatory diseases, such as asthma and chronic obstructive pulmonary disease (COPD). The rise in research into noninvasive airway biomonitoring is due to several factors. The ease of administering these tests compared with more invasive procedures, such as the bronchoalveolar lavage, enables physicians to more closely and effectively monitor airway inflammation in their patients, especially in vulnerable populations (children, aging, developing countries) that are not only more likely to suffer from these chronic respiratory diseases but also prove harder to perform invasive medical procedures on. In addition, there is an increasing goal of subclassifying different molecular and inflammatory phenotypes within these diseases, leading to more personalized therapies based on the specific composition of the inflammation. We present here the current understanding of biomarkers in these three techniques regarding asthma and COPD as well as the overall importance of determining airway inflammation composition. Joseph Mizrahi and Elizabeth Fireman have nothing to disclose in relation to this manuscript. No funding was received in the publication of this article. These are but a few of the discoveries made using airway inflammation to monitor and treat asthma and COPD and that represent the enormous potential that monitoring of airway inflammation can have on the way physicians approach these diseases. This article will further elucidate on the importance of determining airway inflammation composition as well as review some of the known biomarkers currently being studied to monitor asthma and COPD. Determining the exact composition of airway inflammation has become extremely important in classifying the different subtypes of asthma and COPD, which will enable physicians to better cater therapy for their patients. While eosinophilic asthma has been well studied and treatments have been developed that specifically target airway eosinophilia, it is well established that there are those that fit the clinical definition of asthma without an associated increase in their eosinophil count. In fact, there have been four phenotypes of asthma identified based on the inflammatory cell composition of the subject’s lower airways found via induced sputum (IS): eosinophilic (≥3 %), neutrophilic (≥61 %), mixed type (≥3 % eosinophils and ≥61 % neutrophils), and paucigranulocytic type (<3 % eosinophils and <61 % neutrophils).3 Knowing the exact composition of inflammatory cells and correlating it with symptoms and pulmonary function tests will lead to more research into how to best treat each asthma subtype and improve overall care. It is also important to note that while cellular phenotypes have been shown to stay consistent over time in asthmatic adults,8 the same cannot be said for children, whose cellular asthmatic phenotype can change from noneosinophilic to eosinophilic and vice versa.9 Therefore, being able to easily monitor airway inflammation alterations in children is vital to providing the appropriate care and treatment that they need. There is also work being done to determine different COPD phenotypes. Efforts have been made to do this using computer tomography,10 symptoms and exacerbations,11 comorbidities, and lung function tests.12 Despite all being valid, if physicians truly wish to understand and subsequently tailor treatment toward different COPD phenotypes, then assessing airway inflammation, rather than using other measurements, represents the most accurate way of subclassifying the heterogeneous disease. The burden on developing countries from chronic airway diseases is particularly immense due to a multitude of factors, including a lack of basic infrastructure for dealing with chronic diseases (due to the focus on communicable diseases), high exposure rates to chronic airway disease risk factors (indoor pollution, smoking, use of solid biomass fuels), and a lack of appropriate diagnostic tests as well as drugs.14 Also, in addition to the direct medical costs that these diseases inflict, the loss of human capital is detrimental to a developing country’s young economy. Since many of these chronically ill patients cannot work and need another person to help them in their daily living, the indirect costs of asthma and COPD can pose a grave threat to their economies.2 Indeed, COPD and asthma rank 4 and 14, respectively, in terms of disability-adjusted life years (DALYs) at the global level (COPD—29.8 DALYs, Asthma—13.9 DALYs).15 Therefore, it is in the best interest, both medically and economically, to be able to easily and accurately diagnose and monitor those that suffer from these chronic diseases at a low cost. In order to allow assessment of airway inflammation to become a standard aspect of clinical practice, noninvasive techniques must be developed that are both easy for the physician or technician to perform and the subjects themselves to receive. The tests obviously must be reproducible and valid, and the cost of the overall procedure and analysis must be low enough to be adopted in low resource areas. There are three noninvasive procedures currently being used or studied that show the most promise in terms of developing reliable measurements of airway inflammation, and with further research they will hopefully replace invasive airway monitoring altogether instead of merely being a surrogate to biopsy and BAL results as is currently their use. IS can be of immense value to the clinical physician, especially in cases when standard methods of diagnosis (history, spirometry, physical examination) fail to yield an explanation for unclear cough, such as in cough-variant asthma (CVA). A differential cell count can be obtained, and the presence and level of eosinophilic inflammation, for example, in asthmatics, can be used as an indication for ICS or for the adjustment of asthma therapy.28 Moreover, determining if one’s airway inflammation is noneosinophilic is also important, as neutrophilic inflammation is more indicative of COPD than asthma and is associated with increased Global Initiative for Chronic Obstructive Lung Disease (GOLD) stage as well. There are ongoing studies using IS analysis that can assess COPD severity, progression, and risk for future exacerbations.29 Finally, the classification of asthma and COPD phenotypes based on IS cell counts will further our understanding of these diseases and will aid in future research. In addition, IS can serve as a biological monitoring method for those that are exposed to airborne particulate matter (PM). PM is implicated in a host of lung problems and can be found in a variety of occupational exposures and in outdoor pollution. IS has been shown to be able to detect PM in welders,30 foundry workers,31 and even in firefighters who were exposed to dangerous dust particles after the collapse of the World Trade Center years after the exposure.32 Outdoor pollution has been proved to exacerbate asthma in children,33 and IS has been successfully used to detect PM in urban children, even correlating with the presence of eosinophilic inflammation in these patients.34 Overall, the ability of IS to detect PM in airways is another clinically useful benefit of the procedure, especially in vulnerable populations that are exposed to higher percentages of PM. While IS is the most studied and widely implemented of the noninvasive techniques, it does have its drawbacks. It is to some extent invasive, albeit much less so than BAL. IS has proved difficult to perform in children and very ill patients, as the act of expectorating sputum can be stressful for these subjects and some even experience bronchospasm after inhaling the hypertonic saline.35 Performing the procedure, as well as analyzing the sputum samples, requires highly trained lab technicians, limiting the widespread adoption of this method in locations lacking these resources and thus only making IS available in specialized medical centers. Despite efforts to develop shorter and simpler processing of IS samples,36 these factors as a whole currently limit IS from becoming a standard part of asthma and COPD maintenance. Using FeNO measurements to manage and monitor asthma and COPD is an exciting prospect that has undergone much study. Increased FeNO levels have been shown to correlate with eosinophilic inflammation in both asthmatic adults40 and children,23 and a reduction in FeNO levels has been found in patients with asthma that have clinically improved with ICS treatment.41 Asthma symptoms, bronchial hyperresponsiveness, and abnormal lung function have all been found to correlate with FeNO levels as well.42 COPD patients with increased levels of FeNO have been found to respond positively to salbutamol treatment,43 and there is ongoing research into whether FeNO can be monitored as an indicator of treatment response to ICS in patients with COPD.44 Practically speaking, the relative ease of FeNO collection, both in terms of administering the test and for the patients themselves (especially children), as well as the immediacy of the results (for online collections ~5 minutes), makes FeNO an attractive option for noninvasive analysis of airway inflammation. Presently, the prospect of using a single biomarker in order to assess asthma and COPD airway inflammation is becoming increasingly invalid and obsolete, with a multiple biomarker profile emerging as a more clinically useful tool.3 This is due to the ever-increasing understanding that airway inflammatory diseases are heterogenous, with multiple phenotypes and multiple underlying mechanisms of disease being present in both asthma and COPD. Thus, future study should be targeted toward combining the results of different airway inflammatory measurements, providing a more comprehensive analysis of the subject’s airway inflammation. 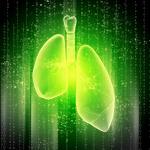 Currently, there are several research groups, such as the Severe Asthma Research Network (SARP)55 and Unbiased BIOmarkers in PREDiction of respiratory disease outcomes (U-BIOPRED),56 which are exploring this avenue of thought. There has been an explosion of research into noninvasive airway monitoring over the past couple of decades, as airway inflammation is increasingly being understood as central to the pathogenesis of chronic airway diseases. Determining different phenotypes within these diseases is also becoming vital to providing appropriate and individualized care. While invasive procedures, such as biopsies and BAL, have provided a means of determining the composition of airway inflammation in the past and still represent the most useful techniques in terms of yielding pathophysiological criteria for these diseases, noninvasive techniques must be further developed and studied in order to address the rising prevalence of these diseases in children and the aging, particularly in an economically feasible way in order to address those living in low resource countries. 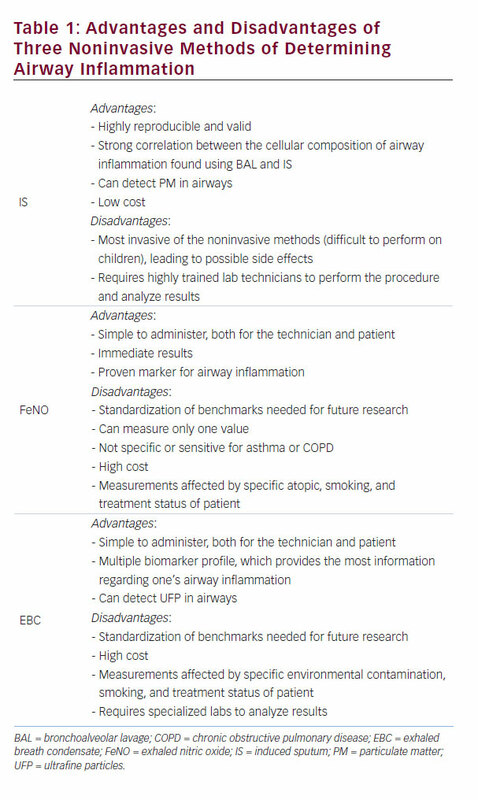 While IS and FeNO are attractive options, EBC presents the best hope of introducing monitoring of airway inflammation into clinical practice, due to its ability to create a multiple biomarker profile, its relative affordability, and the ease of administering and receiving the procedure (see Table 1). More research into these procedures will inevitably transform our understanding and management of chronic airway inflammatory diseases in the future. 1. GINA: Global Strategy for Asthma Management and Prevention (Updated 2015), Bethesda, MD: National Institutes of Health, National Heart, Lung, and Blood Institute, 2015. 2. Global strategy for the diagnosis, management, and prevention of chronic obstructive pulmonary disease: Revised 2015. Global Initiative for Chronic Obstructive Lung Disease (GOLD). Available at: www.goldcopd.org (accessed on September 1, 2015). 3. Vijverberg SJ, Hilvering B, Raaijmakers JA, et al., Clinical utility of asthma biomarkers: from bench to bedside, Biologics, 2013;7:199–210. 4. Pavord ID, Eosinophilic phenotypes of airway disease, Ann Am Thorac Soc, 2013;10(Suppl.):S143–9. 5. Barnes PJ, New concepts in the pathogenesis of bronchial hyperresponsiveness and asthma, J Allergy Clin Immunol, 1989;83:1013–26. 6. Fireman E, Toledano B, Buchner N, et al., Simplified detection of eosinophils in induced sputum, Inflamm Res, 2011;60:745–50. 7. Thomsen M, Ingebrigtsen TS, Marott JL, et al., Inflammatory biomarkers and exacerbations in chronic obstructive pulmonary disease, JAMA, 2013;309:2353–61. 8. Green RH, Brightling CE, Mckenna S, et al., Asthma exacerbations and sputum eosinophil counts: a randomised controlled trial, Lancet, 2002;360:1715–21. 9. Fleming L, Tsartsali L, Wilson N, et al., Sputum inflammatory phenotypes are not stable in children with asthma, Thorax, 2012;67:675–81. 10. Sun XW, Gu SY, Li QY, et al., Pulmonary function parameters in high-resolution computed tomography phenotypes of chronic obstructive pulmonary disease, Am J Med Sci, 2015;349:228–33. 11. Miravitlles M, Calle M, Soler-Cataluña JJ, Fenotipos clínicos de la EPOC, Identificación, definición e implicaciones para las guías de tratamiento, Arch Bronconeumol, 2012;48:86–98. 12. Han MK, Agusti A, Calverley PM, et al., Chronic obstructive pulmonary disease phenotypes, Am J Respir Crit Care Med, 2010;182:598–604. 13. Vos T, Global, regional, and national incidence, prevalence, and years lived with disability for 301 acute and chronic diseases and injuries in 188 countries, 1990–2013: a systematic analysis for the Global Burden of Disease Study 2013, Lancet, 2015;386:743–800. 14. Bousquet J, Khaltaev NG, Cruz AA, Global Surveillance, Prevention and Control of Chronic Respiratory Diseases: A Comprehensive Approach, Geneva: World Health Organization, 2007. 16. Bonilla S, Kehl S, Kwong KY, et al., School absenteeism in children with asthma in a Los Angeles inner city school, J Pediatr, 2005;147:802–6. 17. Amre DK, Infante-Rivard C, Gautrin D, Malo J, Socioeconomic status and utilization of health care services among asthmatic children, J Asthma, 2002;39:625–31. 18. Lodha R, Puranik M, Kattal N, Kabra SK, Social and economic impact of childhood asthma, Indian J Pediatr, 2003;40:874–9. 19. Kinsella KG, Wan H, An Aging World: 2008, Washington DC: US Dept. of Commerce, Economics and Statistics Administration US. Census Bureau; 2009. Available at: https://www.census.gov/ prod/2009pubs/p95-09-1.pdf (accessed on September 1, 2015). 20. Gibson GJ, Loddenkemper R, Lundback B, Sibille Y, Respiratory health and disease in Europe: the new European Lung White Book, Eur Respir J, 2013;42:559–63. 22. Moschino L, Zanconato S, Bozzetto S, et al., Childhood asthma biomarkers: present knowledge and future steps, Paediatr Respir Rev, 2015;16:205–12. 23. Fauci AS, Harrison TR, Harrison’s Principles of Internal Medicine, New York: McGraw-Hill, Medical Publishing Division, 2008;1667. 24. Pizzichini M, Popov T, Efthimiadis A, et al., Spontaneous and induced sputum to measure indices of airway inflammation in asthma, Am J Respir Crit Care Med, 1996;154:866–9. 25. Djukanovic R, Sterk P, Fahy J, Hargreave F, Standardised methodology of sputum induction and processing, Eur Respir J, 2002;20(Suppl. 37):1s–2s. 26. Fireman E, Bliznuk D, Schwarz Y, et al., Biological monitoring of particulate matter accumulated in the lungs of urban asthmatic children in the Tel-Aviv area, Int Arch Occup Environ Health, 2015;88:443–53. 27. Macedo P, Hew M, Torrego A, et al., Inflammatory biomarkers in airways of patients with severe asthma compared with nonsevere asthma, Clin Exp Allergy, 2009;39:1668–76. 28. Lougheed M, Lemiere C, Ducharme F, Canadian Thoracic Society 2012 guideline update: diagnosis and management of asthma in preschoolers, children and adults, Can Respir J, 2012;19:127–64. 29. Shaw J, Vaughan A, Dent A, Biomarkers of progression of chronic obstructive pulmonary disease (COPD), J Thorac Dis, 2014;6:1532–47. 30. Fireman E, Lerman Y, Stark M, et al., Detection of occult lung impairment in welders by induced sputum particles and breath oxidation, Am J Ind Med, 2008;51:503–11. 31. Lerman Y, Segal B, Rochvarger M, et al., Induced-sputum particle size distribution and pulmonary function in foundry workers, Arch Environ Health, 2003;58:565–71. 32. Fireman E, Lerman Y, Ganor E, et al., Induced sputum assessment in New York City firefighters exposed to World Trade Center dust, Environ Health Perspect, 2004;112:1564–9. 33. Wright RJ, Kelly BJ, Programming of respiratory health in childhood: influence of outdoor air pollution, Curr Opin Pediatr, 2013;25:232–9. 35. Erzurum SC, Gaston BM, Biomarkers in asthma, Clin Chest Med, 2012;33:459–71. 36. Fireman E, Toledano B, Buchner N, et al., Simplified detection of eosinophils in induced sputum, Inflamm Res, 2011;60:45–750. 37. Nathan C, Xie Q, Nitric oxide synthases: roles, tolls, and controls, Cell, 1994;78:915–8. 38. Kharitonov S, Yates D, Robbins R, et al., Increased nitric oxide in exhaled air of asthmatic patients, Lancet, 1994;343:33–5. 39. American Thoracic Society, European Respiratory Society, ATS/ ERS recommendations for standardized procedures for the online and offline measurement of exhaled lower respiratory nitric oxide and nasal nitric oxide, Am J Respir Crit Care Med, 2005;171:912–30. 40. Berry MA, Shaw DE, Green RH, et al., The use of exhaled nitric oxide concentration to identify eosinophilic airway inflammation: an observational study in adults with asthma, Clin Exp Allergy, 2005;35:1175–9. 41. Cowan D, Taylor D, Peterson L, et al., Biomarker-based asthma phenotypes of corticosteroid response, J Allergy Clin Immunol, 2015;135:877–83. 42. Van Der Valk RJ, Baraldi E, Stern G, et al., Daily exhaled nitric oxide measurements and asthma exacerbations in children, Allergy, 2011;67:265–71. 43. Angelis N, Porpodis K, Zarogoulidis P, Airway inflammation in chronic obstructive pulmonary disease, J Thorac Dis, 2014;6:167–72. 44. Gelb AF, Barnes PJ, George SC, et al., Review of exhaled nitric oxide in chronic obstructive pulmonary disease, J Breath Res, 2012;6:047101. 45. Horvath I, Hunt J, Barnes PJ, et al., Exhaled breath condensate: methodological recommendations and unresolved questions, Eur Respir J, 2005;26:523–48. 46. Koczulla R, Dragonieri S, Schot R, et al., Comparison of exhaled breath condensate pH using two commercially available devices in healthy controls, asthma and COPD patients, Respir Res, 2009;10:78. 47. Konstantinidi EM, Lappas AS, Tzortzi AS, Behrakis PK, Exhaled breath condensate: technical and diagnostic aspects, Scientific World Journal, 2015:2015:1–25. 48. Benor S, Alcalay Y, Domany K, et al., Ultrafine particle content in exhaled breath condensate in airways of asthmatic children, J Breath Res, 2015;9:026001. 49. Leung TF, Ko FW, Wong GW, Recent advances in asthma biomarker research, Ther Adv Respir Dis, 2013;7:297–308. 50. Lee JS, Shin JH, Hwang J, et al., Malondialdehyde and 3- nitrotyrosine in exhaled breath condensate in retired elderly coal miners with chronic obstructive pulmonary disease, Saf Health Work, 2014;5:91–6. 51. Loukides S, Kontogianni K, Hillas G, Horvath I, Exhaled breath condensate in asthma: from bench to bedside, Curr Med Chem, 2011;18:1432–43. 52. Jia G, Erickson RW, Choy DF, et al., Periostin is a systemic biomarker of eosinophilic airway inflammation in asthmatic patients, J Allergy Clin Immunol, 2012;130:647–54. 53. Moffatt MF, Gut IG, Demenais F, et al., GABRIEL Consortium, A large-scale, consortium-based genomewide association study of asthma, N Engl J Med, 2010;363:1211–21. 54. Adamko DJ, Sykes BD, Rowe BH, The metabolomics of asthma: novel diagnostic potential, Chest, 2012;141:1295–302. 55. Severe Asthma Research Network (SARP). Available at: // www.severeasthma.org/ (accessed on September 1, 2015). 56. Home | U-BIOPRED. Available at: //www.europeanlung.org/ en/projects-and-research/projects/u-biopred/home (accessed on September 1, 2015).